Vani Arvind is a Carnatic Classical Vocalist, originally hailing from Mysore. She started learning vocal music at the young age of 5 under the guidance of Late Vidushi Smt. R. Jalajakshamma, who was a disciple of Karnataka Kalatilaka, Asthana Vidwan Late Sri. S.N. Mariyappa from Mysore. Vani rendered her first concert at the age of 10 and went on to have many concerts to her credit. She has performed extensively in India, US and Middle East. She has numerous accolades and has won many awards during her career. She was conferred “Samaja Ratna”award by Jnana Mandara Educational & Cultural Academy on the occasion of Kannada Rajyotsava celebrations in Bangalore. She is a B-high grade artist of All India Radio (AIR), Mysore and has performed on various occasions for AIR. She has written and composed Music for many kritis and bhajans both in classical and semi-classical styles in Kannada and Hindi under the signature “Shree Vani”. She has a unique talent of writing the lyrics and composing music impromptu. She is also a poet and has written many poems and short stories in Kannada to her credit. 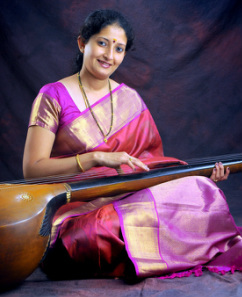 She has been teaching devaranamas extensively in addition to carnatic vocal music since 1993. She currently imparts an education in music to kids and adults in the Central Texas region. She also continues to impart her knowledge through music workshops in various cities. She currently receives guidance from her gurus Vidushi Smt. R. Leelavathi and Vidushi Smt. Bharathi from Mysore. Vani salutes her parents (Smt. R. Pramila and Sri. G. K. Subramanyam) for their untiring support and providing a strong musical foundation.